New Stockist Hey Little Cupcake! Anything in minature teeny form makes us go a bit gooey. If there’s white with splashes of pink involved, even better. Throw cutesy packaging, indulgent edible cupcake treats, and fresh coffee into the mix and we’re ga ga. Introducing Hey Little Cupcake. 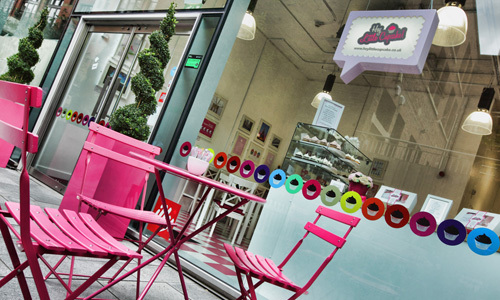 Manchester cupcakery, at Spinningfields. I’ve followed the journey of Sarah’s (founder & owner) was once kitchen table business (like how we started) to the perfectly formed Manchester brand that it is today. And we love her business. Plus this girl’s a savvy marketeer (Picture above: Sarah) and for that we have utmost respect. It’s hard not to have noticed this hot little business in the news if you’re from around Manchester. We were next door to Hey Little Cupcake at the Spinningfields Christmas Pop Up Village in December and met Sarah and the team there. She loved us, we loved her, we gave in to treat temptation daily, Simon sang on camera and the rest is history. Hey Little Cupcake now stock Made With Love’s paper pretties in their cupcakery and my, don’t they sit well. 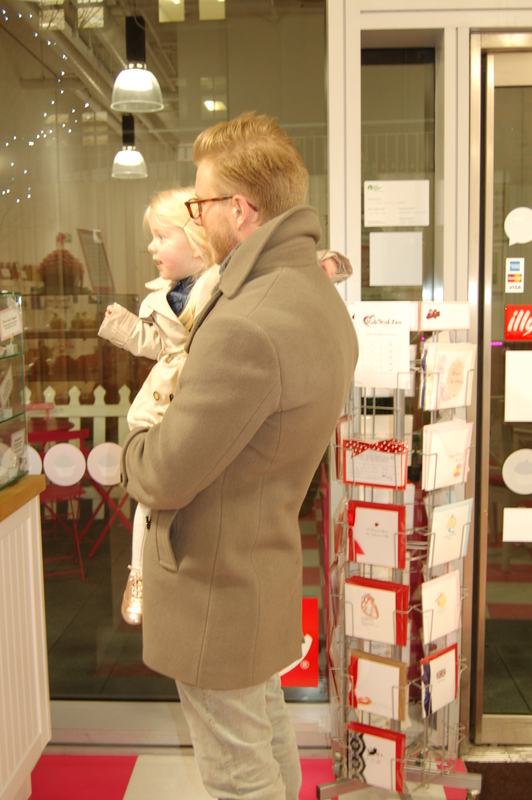 Picture: Simon with Lilly and our Valentine’s cards in the Hey Little Cupcake shop during February. We visited Sarah’s cupcakery for the first time in January with our little girl. We’re all over this place and have been back lots since! It’s our little girls most favourite haunt. We’ll post about our visit in the next couple of days.